Sadya is a feast encompassing the length and breadth of vegetarian cuisine. Its spread can go up to28 dishesat a time. 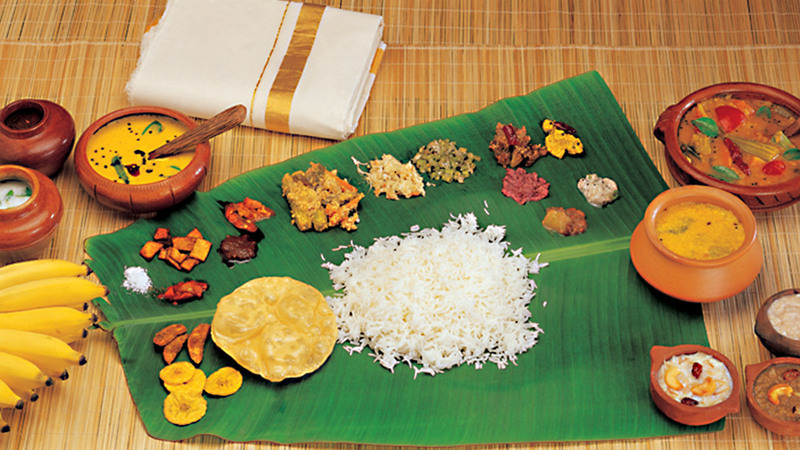 This traditional vegetarian feast of Kerala is among the most favourite delicacies of all who visit our shores. 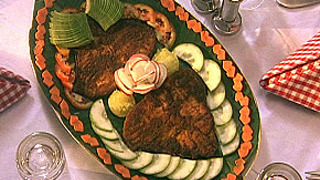 Traditionally, Sadya is served on a plantain leaf, with the tapering side of the leaf pointing to the left of the guest. It consists of par boiled red rice, side dishes, savouries, pickles and desserts, all served at different times of the meal. Rice is usually placed on the lower side of the leaf. First served item after rice is Parippu, which is a liquid curry made from small gram and ghee. It is followed by the South Indian household favourite, Sambar. This vegetable stew can be made from any assortment of vegetables available. They are then boiled in gravy of crushed lentils, onions, chillies, coriander and turmeric with a pinch of asafoetida. Side dishes are equally important. 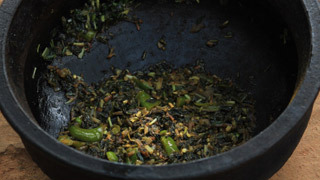 Avial, a combination of vegetables, coconut paste and green chillies, is extremely famous. Fresh coconut oil and raw curry leaves are immediately added after the dish is prepared to add to the flavour of the dish. Thoran is another important side dish. It usually contains minced string beans, cabbage, radish or grams, mixed with grated coconut along with a dash of red chillies and turmeric powder. Olan is a dish which consists mainly of pumpkin and red grams cooked inthin gravy of coconut milk. Major savouries of a Sadya include Upperi (deep fried banana chips), Pappadams (fried wafer of black gram flour), Ginger Pickle and Kichadi (sliced cucumber/ladyfinger in curd, seasoned with mustard, red chillies and curry leaves in coconut oil). They are served along with mango and lime pickle. Payasams, Kerala’s beloved dessert, are served next. There are different variety of Payasams like Pal Payasam, Palada Pradhaman and Kadalaparippu Pradhaman. A payasam is basically a pudding of sweet brown molasses or milk, coconut milk and spices, garnished with cashew nuts and raisins. One normally has a ripe yellow plantain, Pazham, along with it. At the end of the feast, one is served rice again, along with traditionally made Rasam. Rasam is a mixture of chilli and pepperpowders boiled in diluted tamarind juice. Kaalan, seasoned buttermilk with turmeric powder and green chillies along with sour buttermilk with salt and chopped green chillies are served. These are supposed to help with digestion as well. The meal is wound up by folding the plantain leaf in half. Sadya is a feast of flavours and enriches your palate in many ways. It is something to be experienced at least once during one’s life span.